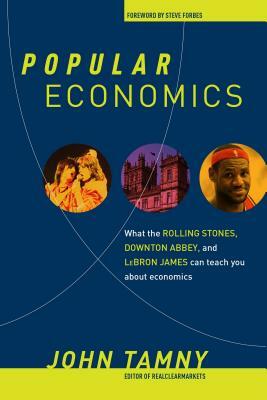 In Popular Economics: What the Rolling Stones, Downton Abbey, and LeBron James Can Teach You About Economics (Regnery Publishing; April 13, 2015; $27.99) Tamny translates the so-called difficult and intimidating subject of economics into plain language, revealing that there is nothing mysterious about finance, commerce, and budgets. In fact, we are all microeconomists in our daily lives. Much like Freakonomics, Tamny uses pop culture and engaging stories to illustrate how understanding our economy is common sense—just look no further than the movies we enjoy, the sports we watch, and what we do every day. John Tamny is the editor of RealClearMarkets and the Political Economy editor at Forbes, where he also has a weekly column. He is a senior director with the Cato Institute and a senior economic advisor to Toreador Research & Trading. Mr. Tamny frequently writes about tax, trade, and monetary policy issues for a variety of publications, including the Wall Street Journal, Investor’s Business Daily, Financial Times, National Review, and London’s Daily Telegraph. He also recently wrote The End of Work. As a regular panelist on Fox News’ Forbes on Fox, he has appeared as a financial expert on numerous television shows, including Your World with Neil Cavuto, and CNBC’s Kudlow Report. Mr. Tamny lives with his wife, Kendall, in Washington, D.C.